Just wanted to share a few thoughts on the summer of sport and culture courtesy of the Olympics. First up are some photos of cultural things from this summer, followed by thoughts on what we can learn from sporting achievements this summer. I thoroughly enjoyed the Paralympic Flame celebrations in Needham Market in late August. 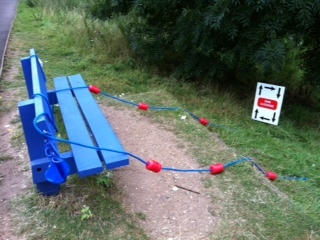 In particular I was thrilled to see the themed benches from local artist Amy Louise Nettleton of My Red Studio. I particularly liked the swimmer’s bench and enjoyed watching a couple of people try on the hat and goggles to be photographed doing a ‘Mobot’ gesture. 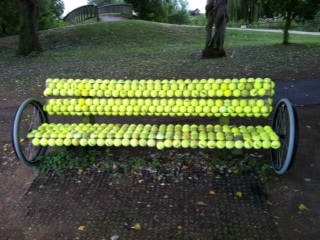 The wheelchair tennis bench was a really popular item, and it must have taken ages to stick all the tennis balls on to the bench. The effect was wonderful and much appreciated. And closer to home in London there were a number of art related events at the Royal Festival Hall which I attended in early August. 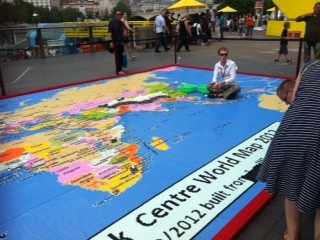 The first was the map of the world built in Lego, complete with mountain ranges! It was an interactive project and you could help to create it yourself, but by the time I got there it was the last day and all that was left to do was blue squares for the ocean. 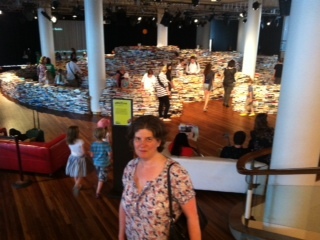 Inside the Royal Festival Hall was a librarian’s nightmare of an art installation: a book maze. It was made of 250,000 books of which 150,000 were donated by Oxfam, the rest came from UK publishers. There was no rhyme or reason for how the books were organised (so no classification, which is why I call it a librarian’s nightmare), but the effect was very dramatic. It was great to see and hear so many children rushing around the maze, and to find one little girl curled up in the middle reading a book. And perhaps best of all braille books were included in the collection – very inclusive. Those of us working in London had dreaded the commute during the Olympics and Paralympics, but our worst fears never materialised. Quite the reverse actually, as London became a really friendly, happy place. Things I’ll miss most from that time are the sound of children’s laughter on early morning packed commuter trains, the volunteers giving you directions at Waterloo station and the tweets from SW Trains about medal winners mixed in with updates on my local train services. Finally, having watched and heard about the successes of all the Olympians and Paralympians I think there are some key lessons we can take from their achievements that can easily be applied to our lives. Vision – be clear about what you want to achieve and by when. Many of the athletes taking part had clearly set their vision on attending London 2012, years before the event and been clear on what they had to do to achieve that vision. Teamwork – visions can’t be achieved without the right support and structure – Team GB Paralympians and Olympians shared the same support teams and noted how important they were to achieving their vision, eg the cycling team. Leadership – is required at all levels in order to make a vision reality – this was clearly in evidence at London 2012 from LOCOG leaders (Seb Coe et al) to athletes to the volunteers. The sun’s out, it’s the end of August and there’s a sense of anticipation and excitement in the air in London. It’s four weeks since I saw the Olympic torch, and the Olympics closing ceremony was 11 days ago. You might have thought Olympic fever had been and gone, and all we had were great memories. Well, think again as next week (29 August) is the start of the Paralympics and the build-up, although on a slightly smaller scale to the Olympics, is nonetheless exciting. I’m sure London will once again have a celebration feel and the wonderful spirit we’ve all enjoyed for the last month will continue. For my part tomorrow I’m heading to the town I lived in as a teenager, Needham Market, Suffolk, which is one of 36 venues in the UK hosting a flame celebration event this weekend. The programme looks fun and features a festival of sport and entertainment running from 2pm-7pm. This is followed by a lantern procession through the town to Needham lake where a spectacular fire show will end the celebrations. We’re one day away from the official start of the London 2012 games, and London (if not the UK) is being engulfed in Olympic atmosphere. 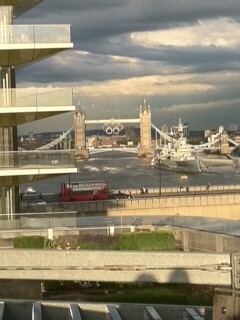 At the SLA conference in Chicago last week lots of people asked me about my reaction to London staging the Olympics. In true British style I replied whingeing about the traffic chaos I’d have to endure! There’s been a lot in the UK media this week telling us all to rejoice in the Olympics being here, but for those of us in London we’re still all grumbling about our journeys to work. Maybe, however, with the opening ceremony tomorrow we’re beginning to revel in the joys of being host city! I’ve started a daily count of sightings of volunteer ambassadors (10 yesterday) and security folk (1 yesterday and 1 this morning) I see around London. While today the torch relay is making it’s penultimate journey around boroughs in London, before heading for the Thames tomorrow. 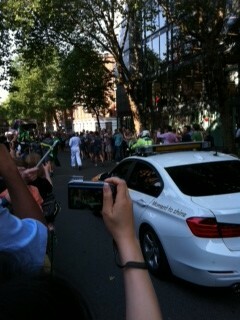 Its route today is close to my office so I took the opportunity to watch and get into the Olympic spirit. 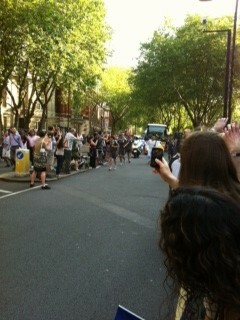 I got to work early at 0745 to go and watch the torch go down Rosebery Avenue. We were lucky to be on a road where spectators were only one person deep, the police were helpful and friendly and it was amusing to watch people coming out of their offices with mugs of coffee to watch. Bemused cyclists, busy commuting to work and unaware of the torch behind them, were greeted with cheers as though they were competing in the Tour de France. The actual torch bearer was preceded by several sponsors’ buses handing out streamers and flags, and several police outriders, all of whom waved, smiled and said hello. The Metropolitan Police must be getting a lot of valuable PR out of the torch relay. It was all over in a flash after the torch bearer ran past, and life returned to normal for all of us. It was a great way to start the day and here’s hoping the next 2 weeks or so are equally as fun. Just don’t ask me about my commute!